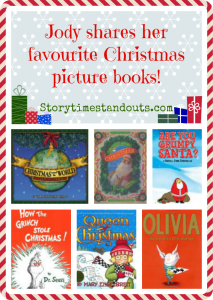 I can’t imagine the Christmas holidays without our special collection of Christmas picture books. Earlier this month, Jody shared her favourites. I have finally put together my own post. 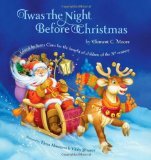 Jody and I both love The Night Before Christmas by Clement Moore, illustrated by Christian Birmingham and read it on Christmas Eve. 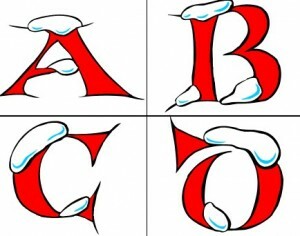 I decided to write about a different version of the poem and mention that reading the same text with different illustrations is great for youngsters. It encourages taking a thoughtful look at the illustrations and making comparisons. This version of the classic Christmas poem is filled to the brim with wonderful extras. Each beautiful two-page spread is framed with details that might otherwise never be seen. As reindeer are prancing and pawing on the roof, we get a glimpse of some special tree ornaments, Santa Claus appears in the fireplace and anxious Pa quickly descends the stairs. Fans of Jan Brett’s work will want to visit her website and discover an abundance of printables including coloring sheets and cards. 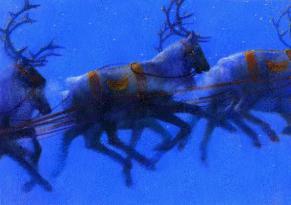 Long before The Polar Express was made into a movie, it was a Caldecott Award winning Christmas picture book. When a friend says, “There is no Santa,” a young boy hopes desperately that his friend is incorrect. On Christmas Eve, he goes to bed and listens intently for the sound of sleigh bells. He does not hear sleigh bells but rather hissing and clanging. He looks out his bedroom window and is amazed to see an enormous train, waiting outside his house. A magical story, The Polar Express will encourage children and adults to believe in the magic of Christmas. 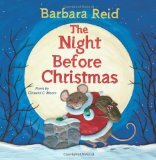 Christmas picture books are in a class of their own. At home, we always keep our Christmas picture books separate from the rest of the piles. We pull them out in late November and tuck them away at the end of the season with all of the other decorations. Just like when we unwrap each ornament that has been packed away for a year, pulling out each story is equally exciting. We forget which ones we have over the year or which new ones we may have purchased at the end of the season and stored away. Over the years, we’ve read many different Christmas tales, but some stay with you throughout the season and beyond. Storytime Standouts has many free Christmas printables – You will find all of our Christmas and Winter-themed printables grouped together here . 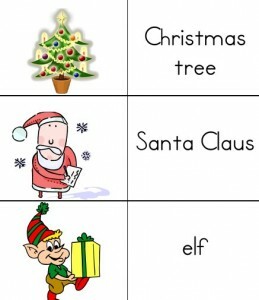 The classic tale that we all know; I love reading this every Christmas Eve. It makes me think of my mom, who recites the words along with me as I read because she knows it by heart. I love that the wonderment of Christmas is displayed through an adult’s eyes. This is, hands down, one of the cutest Christmas books I’ve had the pleasure of reading. 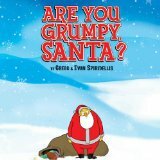 Just like anyone else, Santa can only take so much and finally becomes grumpy when nothing goes his way. The rhyme and the pictures are great. It never fails to amuse me, regardless of how many times I read it. I have always enjoyed Mary Engelbreit’s illustrations. I often buy calendars with her pictures because they are sweet and have nice phrases on them. I purchased this book a few years ago and the illustrations are beautiful. It’s the story of a young girl who is working hard to finish her incredibly long Christmas list before Christmas Eve. Of course, in the end, she learns it’s not what’s on the list that counts. When I purchased this book, it came with a paper doll and clothes, which my children love as much as the book. My mom gave me this book a couple years ago. You are never too old for a good pop up book. Just this morning, my youngest opened one of the pages and said, “Wow! 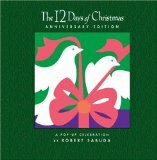 Mommy, look at this Christmassy page!” Featuring a number of different countries, it includes pull outs, interesting facts, and beautiful images. The illustrations in this story are very fun. 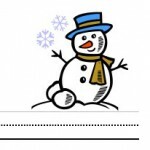 It’s a favourite with my classroom kids, who like to imagine what a snowman could possibly do when no one is looking! I can’t help but love every Olivia book and pairing her with my favourite holiday is just a bonus. As they wait for Santa to finally arrive, Olivia finds many ways to help her mom. My favourite part is when she makes a special mini Christmas tree “centre piece”. I love the rhyme, the characters, and I absolutely love when the Grinch’s heart grows! It’s such a cute and fun story. I’m very glad that my kids are no longer scared of it! Aside from reading to my own children, I love the joy my students get from these picture books. Though we teach differently in the intermediate grades, there is no age, or grade, limit for enjoying these stories. This is a wonderful time of year to engage young children in baking and cooking. Although messy at times, baking with kids and preparing yummy treats to share with others will create memories to last a lifetime – for you and your children. I remember creating sticky and lopsided gingerbread houses with my young boys. I think they ate more of the “decorations” than they actually managed to attach to the houses! Another year, we helped Grandma bake cookies because she was recovering from a stroke and couldn’t manage by herself. The kitchen was a disaster afterwards but the laughter, memories and delicious goodies more than compensated. Kids in the Holiday Kitchen is a fun holiday book that is sure to inspire you and your children. Offering recipes for breakfast, lunch, dinner, snacks and desserts as well as craft ideas, the photographs will have you reaching for cookie cutters, rolling pins and icing sugar. Storytime Standouts has many free Christmas printables – You will find our Christmas songs, rhymes and fingerplays here, Christmas interlined paper here and Christmas words with pictures here.